It’s been a crazy six months since my daughter was born, and I’m only just starting to get back into the grind of writing these screenplays I’ve got sitting around on my computer. I remain hopeful even though progress is dubious at best. There’s the revenge western that seems to be in a continual state of rewrite; the more I tweak, the more there is to tweak. I’ve got a cynical romantic comedy that I’m writing that I’m pretty enthused about, but can’t seem to lock down in terms of plot. This has slowed the momentum considerably. I’ve got a sci-fi mobster flick I’m tossing about in the idea stage. Pretty stoked about that one, but it suffers from the same issues that the romantic comedy currently faces. And then there are at least three to four ideas that are merely “what-ifs” and “hey wouldn’t it be cools.” I’ve also got some produced projects I’m working on parallel to this, but those are shorter form and are not the most favorably received. All of this adds up to a form of screenwriting malaise, which is exacerbated by how little time I have to devote to the act of writing in general (30-40 minutes a day). I assume – like all things – that it will get better, and I push forward with that in mind. After all, if this weren’t my jam I would have given up by now. Making silly noises/faces with my daughter is a REALLY fun distraction from my writing. That cynical romantic comedy I’m working on has been really fun to write, oddly enough. Despite poor reception, I’m having a blast writing those aforementioned projects. The two key characters have a voice that’s fun to play with and subvert. I can’t wait to see where they end up! Interacting with writers on social media. It’s nice to chat (however briefly) with people who write for a living. 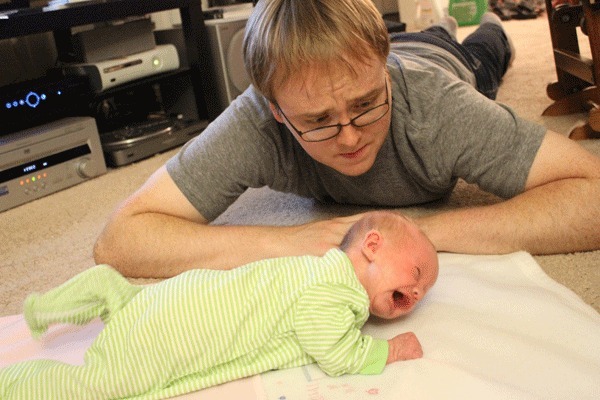 Daughter is starting to crawl. Met John August and Craig Mazin during the taping of the 100th episode of their podcast. That was encouraging in ways I should probably know how to describe as an aspiring writer but don’t. My daughter and I will be playing with her toys on the floor and she’ll look up at me and wait for me to make eye contact before assaulting me with perhaps the most devious smile I have ever seen….and then falling over. I’ve been reading a bunch of screenplays. Those suckers can be kind of tough to find. Well, the ones I want to read, that is. May have just written myself out of that malaise. Okay. Back to the busy. Writing is perhaps the most frustrating craft of all the creative arts, because the product is often so intangible. Even when you put a screenplay in someone’s hand, they perceive it as little more than the starting point for something that they can later see and hear, rather than as the product of all your work. We also live in a society that shows little regard whatsoever toward writers. One of my pet peeves is a Twitter account that tweets lyrics from country music songs…and attributes the lyrics to the performer. My cousin follows this account and often re-tweets these obnoxiously mis-attributed words. “The Dance” is a wonderful song, but Garth Brooks didn’t write it. Tony Arata wrote it. Yet, 99% of anyone who ever quotes from it attributes it to Garth because he’s the one they heard sing it. These factors, and others, make it very difficult to know how to even proceed in developing as a writer. Unlike any other vocation, there’s no clearly defined career path. Even things like workshops are ultimately just peer reviewing sessions that rarely lead directly to the sale of a spec script or a job. There’s no apprenticeship structure, and the only thing that writers who have had success ever seem to say by explanation are that they kept at it until they got their lucky break. Not exactly helpful, adaptable instructions. As far as what you’ve listed of your projects, it sounds like the revenge Western is the farthest along. I don’t know the first thing about getting it into the hands of someone who could actually do something with it, but that would be my advice. You keep finding tweaks to make on your own, so maybe someone else’s eyes would better discern which tweaks are – or are not – necessary. The romcom story frustration sounds familiar. I’ve started half a dozen things where I had characters and a premise that I liked, and then had no idea what to do with them once I established them. The only suggestion I have offhand would be to try brainstorming with someone else, but I’m sure you’ve already tried that. Lastly, eliminate “aspiring”. You’re a writer. Period. You’ve written a web series. You have a “written by” credit. You’re a writer. You undermine yourself with the “aspiring” qualifier. You want respect, and to make money from your craft, and I certainly understand that. You’ll continue to grow as a writer the rest of your life, but you’re every bit a writer now as you’ll ever be regardless of those other things. Own up to it. It’s interesting to note that films are rarely praised for their writing if they are successful, but almost always slammed if they are bombs or financial “disasters.” The outliers are (of course) people like Tarantino, Sorkin, et al. Still, there’s this sense that the writer has the ability to make a sucky product, but no actual agency to make something great. It’s a weird dissonance that I come across when I see people talk about writing in film. There are people who would certainly disagree with you about the whole “aspiring” versus “actual” argument when it comes to writing. Some would even say that the line of demarcation would be whether or not you are a working writer. “If you’re not professional, you’re aspiring.” I kind of play the field with the distinction depending on who I am around or the types of people I interact with. But you do make a good point about having “written by” credit. That does count for SOMETHING, I suppose. Writing is a cruel mistress. I completely get the argument that anyone not making their living from writing is still in the “aspiring” stage. I subscribe to it myself, if I’m being honest. But you do have that “written by” credit, and that *is* something! Well, true. I have things out there that are “technically” produced, and that is pretty killer. There are some attitudes about writing in animation that undercut that, though as a lot of indie animators just write the stuff themselves or they don’t really focus on it and let the visuals tell the story.